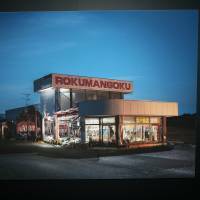 Documenting the severe consequences of the human tragedy that unfolded in the so-called Fukushima “no-go zone” following the March 11, 2011, disaster is an undertaking that would evoke raw emotions under ordinary circumstances. 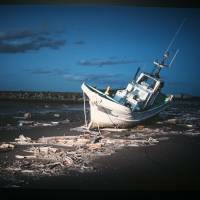 But for photographers Carlos Ayesta and Guillaume Bression, shining a light on those surroundings and the people whose lives were irreparably altered by the Fukushima Daiichi nuclear plant’s triple meltdown through artwork touches a nerve in a way that other modes of media fail to convey. 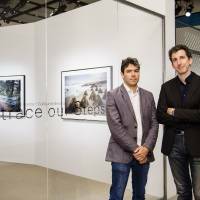 Their photo exhibition entitled “Retrace Our Steps” is the outcome of five years of work in traveling to deserted towns in the 20-kilometer exclusion zone to document what has changed but most of all to tell a story without injecting political commentary about the consequences in the lives of the evacuees. The magnitude-9 earthquake and subsequent tsunami triggered the world’s worst nuclear crisis since the 1986 Chernobyl accident. Some 160,000 residents fled radiation after the government-enforced evacuation. According to the Reconstruction Agency, more than 41,000 residents still live outside Fukushima Prefecture today. Whether people will return or remain elsewhere after having had their lives uprooted was one of the main topics Bression and Ayesta discussed in their encounters with evacuees. It was also important to talk with them about their experiences on the day of the disaster as part of the retrospective. They took portraits of them pretending as if life were normal inside abandoned buildings, some of which the subjects themselves either had worked or lived in, creating a surreal effect. The first series called “Clair Obscure” (a technique that uses strong contrasts between light and dark) focuses on the eerie ghost towns left behind by people ordered to evacuate or who left of their own accord due to fears of radiation in the wake of the nuclear crisis. 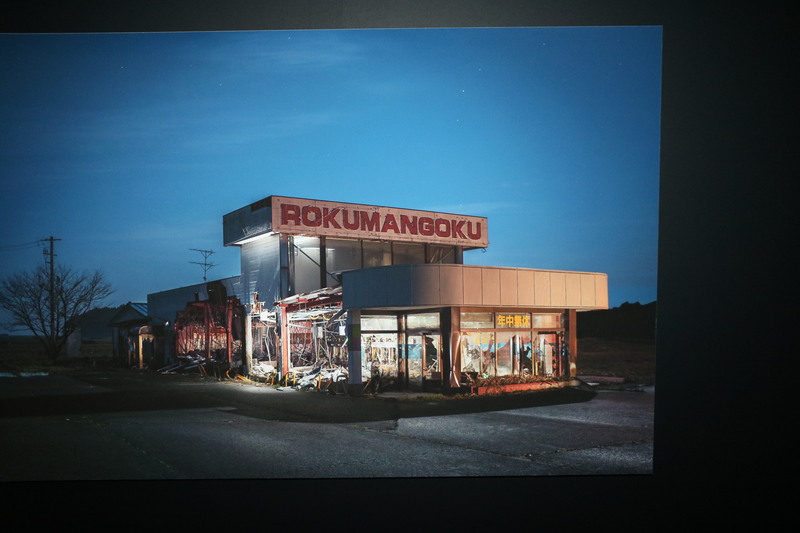 The bleak landscapes in the no-go zone, the last designation of which was lifted in the district of Futaba in May 2013, were documented at night where Bression said time appeared to stand still. He said they had hoped to bring these areas, which were nearly devoid of light, to life but instead found that the use of artificial light created by flashes only accentuated the desolation, creating a sense of angst as they stood amid these forgotten cities. Born in Paris, Bression, 35, who has been based in Tokyo since a few months before the Great East Japan Earthquake, specializes in documentary photography. He also works for several French magazines, newspapers, and television broadcasts. Ayesta, 31, who hails from Caracas and is based in Paris, is a specialist in architectural photography. 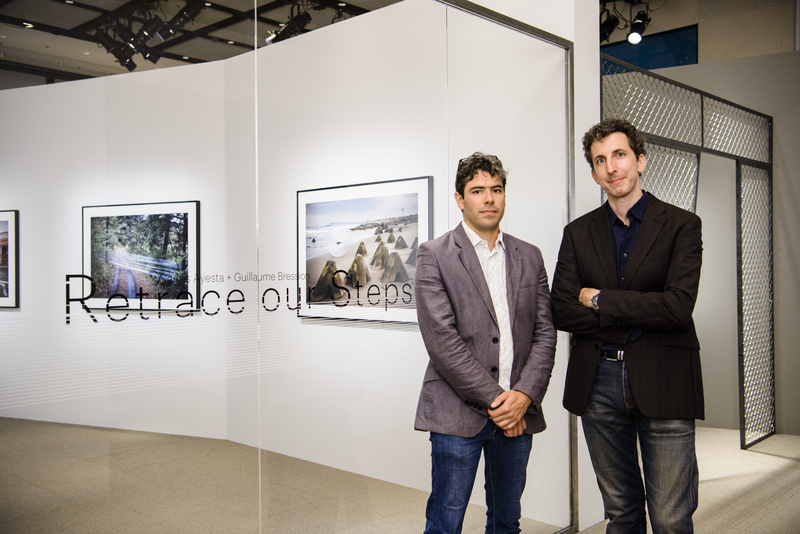 The four other parts of the series — “Bad Dreams,” “Nature,” “Packshots” and “Retrace Our Steps” from which the exhibition gets its name — are integral to their combination of artistic work using a documentary approach. In “Bad Dreams,” for example, Bression and Ayesta aim to depict radioactivity using plastic bubbles encapsulating images of people and other objects or cellophane wrapping streamed across areas that have been deemed contaminated to signify the invisible menace. “Nature” is a compilation of photos showing how nature will impose itself, overrunning everything, including abandoned buildings and other artifacts left behind in its path, with vegetation as time passes. Ironically, the products are shot in packshots — a method often used by catalogs to portray a product’s reputation in advertising, although these products will obviously never be sold or used for public consumption. Bression says getting people to openly participate in their project took time. At the beginning of July, the number of displaced residents inside and outside the prefecture due to the triple disasters still stood at around 89,000. Whether these people would decide to return for good after their temporary visits back home was one of the big questions. After all, what is there exactly to return to? “Among the people we spoke to no one said they will come back; I would not say that it’s everybody, but especially the bigger the city is the smaller the percentage of people who will come back because the community has been totally destroyed,” he says. 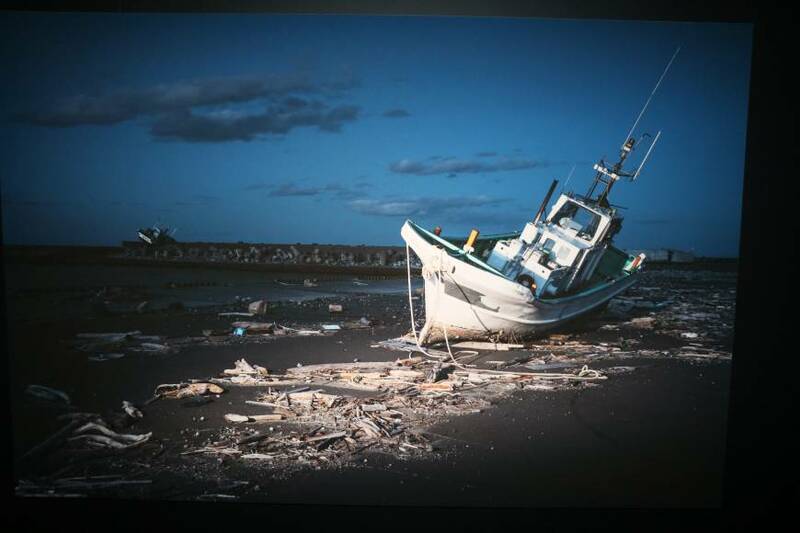 Although the photo exhibition, which is being held at Chanel Nexus Hall in the upscale Ginza district until July 24, has been well received thus far, Bression realizes that not everyone appreciates the portrayal of art in the context of a disaster. The photographers are conducting a crowdfunding campaign until the end of the month on Kickstarter to raise money for the “Retrace Our Steps” book they plan to publish in November.